MA Fine Art students Georgina Nicolaou and James Pimperton were this year awarded £8,500 each to pay for their MA fees, funded by the Zsuzi Roboz Turst through the Chelsea Arts Club. The first awards of their kind from the Roboz Trust, they were set up in the name of renowned portrait painter and ‘lively Bohemian character’ Zsuzi Roboz to support two home or EU MA Fine Art students with a special interest in painting, especially as numbers of students progressing into postgraduate study nationally are falling. We interviewed recipient James Pimperton about his work and the impact he hopes that postgraduate study will have on his practice. Tell us about what and where you studied before arriving at Chelsea? 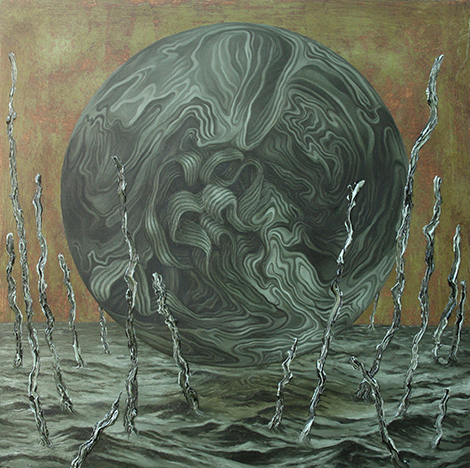 Globe 2014, Oil on Panel by James Pimperton. “My recent work stems from an interest in the history of painting. I am questioning what, in the current panoply of media and ideologies, painting has to say about the way we perceive the world. Painting, in particular 20th century painting, was a series of differing ideologies, each asserting a space or discrete perspective that seemed new or visionary and that was believed to be somehow truer than the others. Inevitably each movement lost its momentum. Through repetition each lost what was supposed to be its primary voice and was left making versions or portraits of itself. This allowed other movements to respond and assert their own ideology. At such moments of obsolescence questions were asked about the relevance of painting at all; a recurring death of painting. We now find ourselves in a period of plurality, where many forms of painting may coexist. A pattern however does emerge; one that could be said to link all of the movements and ideologies into something resembling a logic or nature of painting, and this is painting’s apparent need for a recurrent cycle of birth, death and rebirth. Perhaps painting isn’t a single perspective, ideology or method, but perhaps what it is – by its very nature and what keeps it relevant – is that it is a state of flux; a self-questioning and self-deprecating flow of contradictions. My work is attempting to visualise this, not by picking past visual ideologies and forcing them into a dialogue (as was the case with several nostalgic strands of postmodernism), but by actively trying to make a paintings that galvanise this overall logic or character of painting into an artwork. 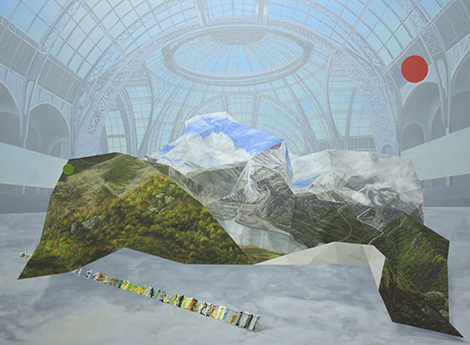 Exposition 2011, oil on linen by James Pimperton. Tell us about how you became to be involved with the Roboz Trust awards and Chelsea Arts Club. What has studying at Chelsea been like so far? Why did you decide to study at Postgraduate level? In what ways do you hope you and your work will develop as a result of postgraduate study? 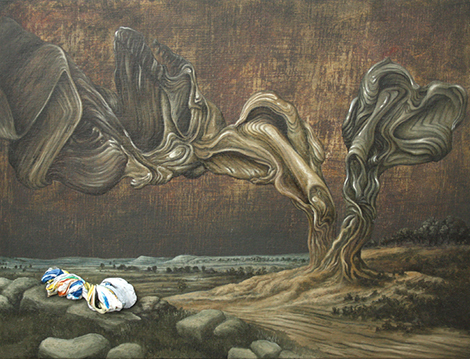 Germinate 2012, Oil on Panel by James Pimpterton. What do you hope to do following your course here? Find out more about the Chelsea Arts Club Trust on their website. Find out more about studying MA Fine Art at Chelsea on our course page. Find out more about research at the Camberwell, Chelsea and Wimbledon Graduate School on our research pages.